Uptown Alley - What Is This Place? Uptown Alley isn't just a bowling alley. It is an entertainment destination in the northwest part of the Greater Phoenix area, specifically, in Surprise, Arizona. It is a multifaceted, 60,000 square foot venue where you can play action games, video and competitive carnival-type games; enjoy live entertainment; or eat, drink, relax and mingle....or you can do all of those things. There are activities here for all ages: bowling, laser tag, billiards and electronic games. You'll find a full service restaurant, sports theater, bars, karaoke/entertainment stage and an adults only lounge. There are prizes and party rooms. Uptown Alley is bright and loud and exciting and fun. One of the unique features of Uptown Alley is that you have the ability to enjoy it it many ways. For family fun, you can play together if you choose, or have everyone arrive together and then head to their favorite activities on their own. It's a great place for a date night, or, if you have other activities planned, you can also just stop in at Red Embers Bar & Grill for lunch, dinner or drinks at the bar. The menu includes burgers, salads, pizza, pasta and barbecue specialties. Try the Lobster Mac & Cheese ... this isn't a fast food joint! Uptown Alley doesn't have any activities for babies or toddlers, but that age group is the only one that won't be entertained here. The electronic and video games here are big, colorful, bright, new and exciting. These are not your dated pinball machines -- although seeing an updated version of skee ball and a full-body electronic version of whack-a-mole gave me a pleasant nostalgic feeling. Those games are still fun! Some games are competitive, some are interactive, some are more like rides than games. I saw people ages 5 through about 70 enjoying the games during my visit. Warning: I notice that some games here include violent themes. The games are marked as such, but unless the parents are supervising their children (always highly recommended) the kids might play these games and be unaware of the rating. Laser tag takes place in a two-story maze, and is appropriate for all ages as well. It is especially well-suited to a party or corporate group. Hey Red Hat Ladies, have you ever tried laser tag? From time to time there may be family entertainment on the stage. Check the entertainment schedule to see what's happening. Naturally, a large part of the building is devoted to the 40 lanes of the newest and greatest bowling by Brunswick. Like traditional bowling alleys, you can rent shoes and get bumpers for the little ones. These lanes have electronic scoring, projection HD TVs and plenty of seating and lounging areas. Leagues, private parties, family outings, couples, friends, co-workers -- bowling is for everyone. 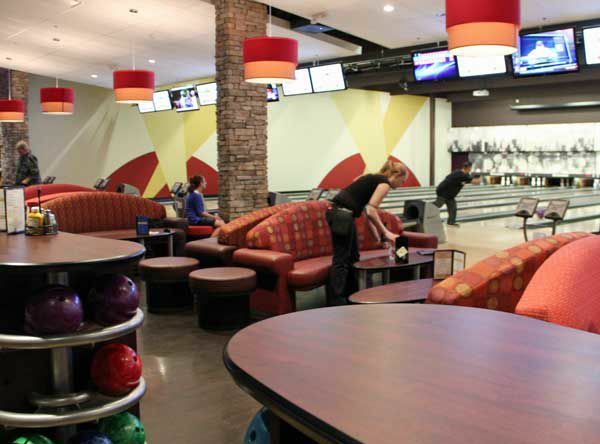 Some of the featured attractions at Uptown Alley are designed with adults in mind. Themed bars are for drinks, snacks, mingling, lounging, billiards, and watching sports on big screen TVs. When it's karaoke time, or bands are playing, or if you are simply hanging out here while your kids attack each other with lasers, you can relax close to the action, or find a quieter lounge. The Approach is the name of the adults-only (21+) ultra lounge at Uptown Alley. It is an age-restricted area with a full bar, HD TVs with music videos, 10 bowling lanes, DJ, dancing and billiards. Out on a date night? Want to get away from the lights and noise? This may be the place for you. The Approach is also available to rent for private events. At 10 p.m. underage guests are asked to leave Uptown Alley unless they are accompanied by an adult. (Surprise, AZ has a curfew). Just chillin' while the kids play their little hearts out? Free wi-fi is available throughout the building. Uptown Alley is located in the northwest part of the Greater Phoenix area, in Surprise, Arizona. You'll find it at Litchfield Road just north of Cactus Road. It is in the same plaza as the UltraStar Surprise movie theatre. From Grand Avenue: take Thunderbird west (becomes Waddell Rd) to Litchfield Road, and then turn south (left). From the south and west: take SR303 to Cactus Road and turn east. Drive to Litchfield Road and turn north (left) on Litchfield. Fees for bowling vary depending on when you bowl. Sunday through Thursday all day and Friday/Saturday before 6 p.m. there is a per line charge. On Friday and Saturday after 6 p.m. there is a per hour charge for a lane, maximum 6 people per lane. Bowling shoes are available to rent. Bowling in The Approach is for guests who are 21 years of age and older, and the charges may be slightly higher. Laser tag has a per game rate. The more games you buy, the better the deal. Games are about 15 minutes in length. In order to play games you must purchase a game card. There's a one-time small charge for the card. You may load the card with game credits, and the card can be kept permanently and recharged on any visit. The more credits you purchase at one time, the better the price. Each game requires a specified number of credits to play, displayed on the game itself. Check online for weekly specials for food and beverage, as well as for bowling, games and family packages. Looking for Indoor Fun? Find it at Peoria AZ's Trampoline Park!